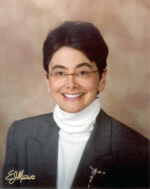 Silvia M. Ferretti, D.O. is the Provost, Vice President and Dean of Academic Affairs at the Lake Erie College of Osteopathic Medicine (LECOM) in Erie, Pennsylvania. When LECOM opened in 1993, Dr. Ferretti became the first woman dean of an osteopathic medical college. The college trustees promoted Dr. Ferretti to Provost as LECOM expanded to include a School of Pharmacy. Dr. Ferretti is a Clinical Professor of Internal Medicine/Physical Medicine and Rehabilitation at LECOM. Currently, she is active in the Student Promotion and Graduation Committee, the Curriculum Committee, and the Osteopathic Graduate Medical Education Committee. Prior to joining LECOM, she was chief of rehabilitation at Great Lakes Rehabilitation Hospital in Erie and taught at the Philadelphia College of Osteopathic Medicine where she earned her Doctor of Osteopathic Medicine Degree. She completed her internship at the Hospital of Philadelphia College of Osteopathic Medicine, and subsequently, a residency in Physical Medicine Rehabilitation at the Hospital of the University of Pennsylvania, Philadelphia, Pennsylvania. Dr. Ferretti is a past Chairperson of the Commonwealth of Pennsylvania’s, Department of State, Bureau of Professional and Occupational Affairs, State Board of Osteopathic Medicine. Dr. Ferretti is a past Chairperson of the American Association of Colleges of Osteopathic Medicine Board of Deans Executive Committee. She is also a member of, and affiliated with, the AOA; the American Osteopathic College of Rehabilitation Medicine; the American Congress of Rehabilitation; the American Academy of Physical Medicine and Rehabilitation; and the Erie County Medical Society. Dr. Ferretti is also a delegate and a member of the board of trustees of the Pennsylvania Osteopathic Medical Association. In addition, she has recently received two Ebony Excellence awards from Edinboro University of Pennsylvania for outstanding community service and academic/educational excellence. She is a recipient of the Distinguished Pennsylvanian Award from Gannon University in Erie, Pennsylvania in recognition of her contributions to the community, as well as a Proclamation from former Governor Tom Ridge for dedication to personal, community and professional excellence. She has also been awarded a citation from the Pennsylvania House of Representatives for professional excellence and humanitarianism. She is an honored life member listed in Strathmore’s Who’s Who Millennium Edition. The American Osteopathic Association also inducted Dr. Ferretti into the AOA Mentors Hall of Fame an honor given to those physicians who teach osteopathic medical students, interns and residents and guide them on their careers as physicians.